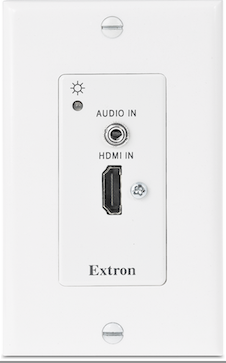 The What: Extron Electronics has introduced the DTP T HWP 231 D and DTP T HWP 331 D, single-gang Decora-style transmitters for sending HDMI, audio, and bidirectional RS-232 and IR signals over a shielded CAT-x cable to Extron DTP-enabled products. The What Else: The DTP T HWP 231 D extends signals up to 230 feet (70 meters), while the DTP T HWP 331 D extends signals up to 330 feet (100 meters). The one-gang form factor provides maximum space efficiency in wall mount, floor box, and furniture mount applications. The transmitters support computer video up to 2560x1600, HDTV 1080p/60 Deep Color, and 4K resolutions. Both models also accept analog stereo audio signals for simultaneous transmission over the same shielded twisted pair cable. They feature remote power capability, plus bidirectional RS-232 and IR pass-through for remote AV device control. The single-gang wall-mountable design of the DTP T HWP 231 D and DTP T HWP 331 D provides the convenience of placing input connections precisely where they are needed. "These latest DTP twisted pair transmitters meet the needs of AV integrators for wallplates in an even smaller form factor to fit into floor boxes and the tightest spaces for streamlined DTP System designs," says Casey Hall, vice president of sales and marketing for Extron. "The efficient one-gang design provides that needed connectivity, sending HDMI source signals from the convenience of the wall, floor, or lectern." The transmitters also offer an HDBaseT output mode that provides the additional integration convenience of a twisted pair output that is compatible with any HDBaseT-enabled display. The DTP T HWP 231 D and DTP T HWP 331 D mount in an included Decora-style wallplate designed for installation in one-gang US wall boxes. The Bottom Line: The DTP T HWP 231 D and DTP T HWP 331 D support 12-bit Deep Color, CEC pass-through, and embedded HD lossless audio formats. Both transmitters maintain DDC communication of EDID and HDCP between a source and display for reliable operation. To streamline installation, they can be remotely powered by Extron DTP CrossPoint 84 matrix switchers or other DTP-enabled products over the twisted pair cable.